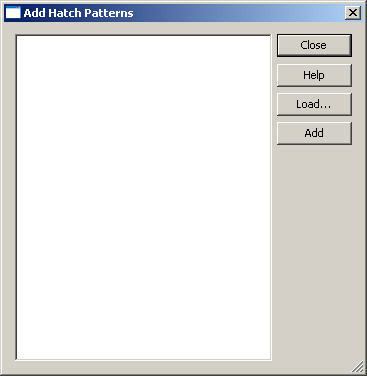 The Add Hatch Patterns dialog, shown below, appears when you click the Patterns button on the Select Hatch Pattern dialog. You can load patterns from other directories into the dialog using the Load button. The Hatch folder contains extended patterns in the file Extra.pat (21 additional patterns.) To add patterns to the part, select them in the list, and click the Add button. A checkmark appears on top of the selected patterns indicating they have been added to the part. Note that if the selected pattern already exists in the part, the checkmark appears without a new copy of the pattern being added. Once you have added the desired patterns, click the Close button to close the dialog.